An image showing the location of the first suspected Thorne-Zytkow object (TZO), a long-theorized hybrid star thought to form when a red supergiant swallows a neutron star. This likely TZO, known as HV 2112, lies in the Small Magellanic Cloud, about 200,000 light-years from Earth. For astronomers, it's the equivalent of buried treasure in space: a strange hybrid star — actually, one star packed inside the shell of another, larger star. That's apparently what happens when a dying star swallows a smaller, dead star. And for decades, this exotic cosmic rarity was only theory, a wild idea hatched by an astronomer and a now-famous physicist and an astronomer. Neutron stars are extraordinarily dense corpses of normal stars. Red supergiants are dying stars with the greatest diameters of any star in the universe, ranging from 200 to 2,000 times wider than the sun — "so big that if you placed them where our sun is, they would extend out to, or even beyond, the orbit of Saturn," said study lead author Emily Levesque, an astrophysicist at the University of Colorado at Boulder. The news study, which details the likely discovery of the Thorne-Zytkow object, was published in the Sept. 1 issue of the journal MNRAS Letters. News of the find first came out, and was previewed in June, shortly after the study was submitted to the online preprint site arxiv.org. A TZO is typically thought to form when a red supergiant engulfs an orbiting neutron star. The merger would result in "a shell of burning material around the neutron core — a shell that would generate new elements as it burned," Thorne said in a statement. "Convection, the circulation of hot gas inside the star, would reach right into the burning shell and carry the products of burning all the way to the surface of the star long before the burning was complete." A TZO should appear virtually identical to a very bright red supergiant. However, a TZO's unique innards should produce unusually large amounts of rubidium, strontium, yttrium, zirconium, molybdenum and lithium, setting it apart from a normal red supergiant. Now, scientists have detected a red supergiant with the distinct chemical signature of a TZO, suggesting they may have detected these space oddities for the first time. "I am extremely happy that observational confirmation of our theoretical prediction has started to emerge," Zytkow said in a June statement. The candidate TZO is named HV 2112. The star is a member of the Small Magellanic Cloud, a dwarf galaxy about 199,000 light-years away that is a close neighbor of the Milky Way and easily visible to the naked eye from the Southern Hemisphere. 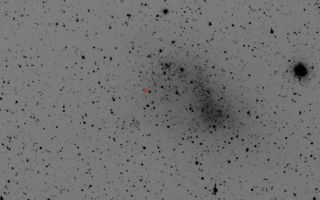 The researchers identified HV 2112 after a survey of 62 red supergiants conducted with the 6.5-meter (21.3 feet) Magellan Clay telescope in Chile and the Apache Point Observatory 3.5-meter (11.5 feet) telescope in New Mexico. "On our first night at the Magellan telescope, we had a fantastic 'Hmmm, that's odd' moment," Levesque told Space.com. "We were displaying the raw data as we took it, and when one star's data popped up, we could tell, even in that messy format, that the spectrum was unusual. Our co-author Nidia Morrell [of the Carnegie Observatories in La Serena, Chile] looked at the data for this star and immediately said, 'I don't know what it is, but I know that I like it!'" "It was our first inkling that there was something different about this star," Levesque said. "And that star turned out to be HV 2112." The scientists confirmed excess levels of rubidium, molybdenum and lithium in HV 2112's gaseous shroud. "If HV 2112 is found to be a bona fide TZO, this would have huge implications," Levesque said. "It could offer the first solid evidence for a completely different model of how stars' interiors can work. Inside these stars, we also have a new way of producing elements, and knowing where the various elements come from is a critical ingredient in trying to understand how the universe works. We hear that everything is made of 'star stuff' — inside TZOs, we might have found a totally new way to make some of it." The evidence that HV 2112 is a TZO is strong "but not ironclad," Thorne said in a statement. "Certainly it's by far the best candidate for a TZO that anyone has seen, but additional confirmation is needed." Although HV 2112 looks exactly how the researchers expected a TZO to look, "some of those expectations are based on models and predictions from a couple of decades ago," Levesque said. "It's possible that when modern-day models are run, they will give us new things to look for or new ideas of what a TZO might look like." Levesque noted that she had already "gotten dozens of emails from people who are interested in running their own new computer models to test how TZO interiors work, how they might form or evolve, or even whether or not they can stably exist. "A few months ago, TZOs were an interesting but somewhat obscure topic, but our discovery has spurred a renewed interest in these stars," Levesque said. "Whether people are criticizing our findings or setting out to prove us wrong honestly matters less to me than the fact that new research on TZOs is underway — the more people study them, the more we'll know!" Levesque said that after she and her colleagues get more information on what modern-day models predict TZOs should look like, they would like to get more observations of HV 2112 and its surroundings "to see if there are any other strange quirks or tell-tale signs of it being a TZO." "Searching for more TZOs would obviously be exciting, too," Levesque added. "Finding one is interesting, but if we find several, we'll be able to learn so much more."